Yet the public remains largely divided in its views of the overall effect of immigration. Roughly as many believe that newcomers to the U.S. strengthen American society as say they threaten traditional American values, and over the longer term, positive views of Latin American immigrants, in particular, have improved dramatically. Reflecting this ambivalence, the public is split over many of the policy proposals aimed at dealing with the estimated 11.5 million-12 million unauthorized migrants in the U.S. Overall, 53% say people who are in the U.S. illegally should be required to go home, while 40% say they should be granted some kind of legal status that allows them to stay here. But nearly half of those who believe illegal immigrants should be required to leave nonetheless say that some could stay under a temporary work program. Overall, the public divides about evenly among three main approaches for dealing with people who are in this country illegally: 32% think it should be possible for them to stay permanently; 32% believe some should be allowed to stay under a temporary worker program under the condition that they leave eventually; and 27% think that all illegal immigrants should be required to go home. There is also a division of opinion over how to stem the flow of illegal immigrants across the Mexican border. When asked to choose among three options, roughly half of Americans (49%) say increasing the penalties for employers who hire illegal immigrants would be most effective in reducing illegal cross-border immigration, while a third prefer boosting the number of border patrol agents. Just 9% of the public says the construction of more fences along the Mexican border would be most effective. In general, however, the issue of immigration is not a top-tier problem for most Americans. Just 4% volunteer it as the most important problem facing the country, far fewer than the number mentioning the war in Iraq, dissatisfaction with the government, terrorism, and several other issues. Nor does immigration loom particularly large as a local community issue. The new survey by the Pew Research Center for the People & the Press and the Pew Hispanic Center, conducted Feb. 8-March 7 among 2,000 adults nationally, includes separate surveys of an additional 800 adults in each of five metropolitan areas that have experienced differing rates of immigration in recent years: Phoenix, Las Vegas, Chicago, Raleigh-Durham and Washington DC. Immigration emerges as a dominant local concern only in Phoenix, near a major entry point for illegal immigrants, where 55% say it is a very big problem. In the four other metropolitan areas, traffic congestion rates as a bigger problem than immigration. The survey finds a number of opinions about immigrants that may well contribute to ambivalent attitudes toward immigration, especially in areas where immigrants are most numerous. First, attitudes toward both Latin American and Asian immigrants are more positive now than in the 1990s, even as concern over the problems associated with immigration has increased. Both groups are overwhelmingly seen as very hard working and having strong family values. Impressions of Latin American immigrants, in particular, have grown much more positive, with 80% describing them as very hard working compared with 63% nearly a decade ago. Moreover, native-born Americans who live in areas with the highest concentration of immigrants hold more positive opinions of them. Analysis of the survey indicates that their more favorable views do not merely reflect their demographics or political composition, but suggests that exposure to and experience with immigrants results in a better impression of them. However, Americans living in areas with more immigrants rank immigration as a bigger community problem. And while there is concern about the impact of immigration on the availability of jobs, nearly two-thirds (65%) say that immigrants coming to the country mostly take jobs that Americans do not want, rather than take jobs away from Americans. In this regard, the recent influx of immigrants into such metropolitan areas as Phoenix, Las Vegas and Raleigh-Durham has not undermined the generally positive perceptions residents have of the local job market. Yet at the same time, a sizable minority (16%) says they or a family member have lost a job to an immigrant worker. And the perception of being passed over – more common among those with less education and lower incomes – is strongly associated with negative views of immigrants and high levels of support for strong measures to deal with the problem. For example, 75% of those who say they or a family member has lost a job to an immigrant view them as a burden compared with 47% of those who do not think this has happened. The public’s divisions over illegal immigration are mirrored in views of legal immigration; 40% say the current level should be decreased, but almost the same number (37%) believe it should be kept at its present level, while 17% prefer to see it increased. But it is illegal immigration, far more than legal immigration, that stirs public anxiety. Six-in-ten say illegal immigration represents a bigger problem than legal immigration. Just 4% say the opposite – that legal immigration is a bigger problem – though nearly a quarter (22%) says both forms of immigration are equally problematic. Besides economic concerns, many express worries that illegal immigrants contribute to crime and increase the danger of terrorism. Yet fewer see tougher border controls, relative to employer sanctions, as the most effective way to reduce illegal immigration along the Mexican border. Even those who are most worried about the threat of terrorism associated with illegal immigration favor employer fines over border fences and more agents. In line with these attitudes, two-thirds of the public favors the creation of a new government database for all of those eligible to work – citizens and legal immigrants alike – and a requirement that employers check this database before hiring new workers. Even more Americans support a de facto national identification card – either a Social Security card or new form of driver’s license – that job applicants would be required to show before obtaining a job. Like policymakers, the public is conflicted about what to do with immigrants who are here illegally. Beyond questions of their legal status, Americans express very different opinions about providing government services for such people – and their children. By a wide margin (67%- 29%), Americans believe that illegal immigrants should be ineligible for social services provided by state and local governments. Yet by an equally lopsided margin (71%- 26%), most feel that the children of illegal immigrants should be permitted to attend public schools. The survey finds a complex relationship between exposure to immigrants and opinions about them and the immigration problem, more generally. People who live in areas that have high concentrations of immigrants are less likely to see them as a burden to society and a threat to traditional American customs and values. However, they are more apt than others to see immigration as an important problem for their local community. In sharp contrast, native-born Americans who live in areas with few immigrants understandably are less inclined to see immigration as a local problem. However, many more of those in areas with relatively low concentrations of foreign-born people see immigrants as a burden to the nation and as a threat to American customs. People living in areas with few immigrants have a considerably more negative opinion of Hispanics and a slightly more negative view of Asians. In general, the survey shows broad public recognition of the increasing level of immigration in recent years. Significantly more Americans than in the 1990s think that there are “many” recent immigrants living in their communities (35% currently vs. 17% in 1997). In each of the metropolitan areas surveyed separately, with the exception of Chicago, nearly half say there are many recent immigrants in their area. Similarly, as many as 49% nationwide say they often come in contact with people who speak little or no English, up from 28% in 1997. This experience is very common in Las Vegas and Phoenix – 68% of Las Vegas residents and 66% of Phoenix residents say they often encounter people who speak little or no English. Most Americans who come in contact with people with little English say it does not bother them (61%), compared with 38% who say that it does. The balance of opinion is similar in the five metropolitan area surveys. 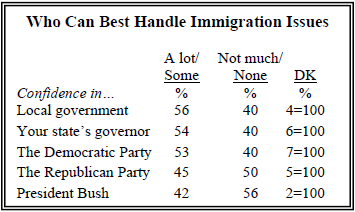 The American public is not particularly confident in its political leadership to deal with immigration. President Bush and the Republicans get especially anemic grades. Only 42% have a lot or some confidence in President Bush to do the right thing with regard to the issue. The Republican Party gets a similar rating (45%). The Democratic Party achieves an only somewhat better evaluation (53%) as do governors (54%) and local leaders (56%). Residents of the five metropolitan areas surveyed separately evaluate their political leadership on the immigration issue about the same way citizens do nationwide. The exception is Governor Janet Napolitano of Arizona and local officials in Phoenix who achieve better ratings than other governors and local leaders. Hispanics are more critical of all political leaders than are other citizens, but especially with respect to the Republican Party. However, they give President Bush a somewhat better grade than they do the GOP (41% vs. 33%). For the most part, partisanship has only a modest impact on attitudes toward the severity of the problems associated with immigration and possible solutions. On basic attitudes as to how to reduce illegal immigration from Mexico, roughly half of Republicans, Democrats and independents prefer tougher employer sanctions; only about one-in-ten in each group thinks the construction of more border fences would be the most effective measure. About the same number of Republicans and Democrats also say illegal immigrants in the U.S. must go home. 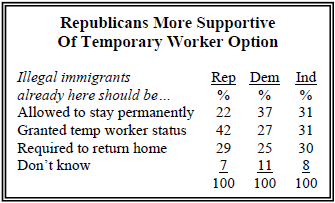 However, it is noteworthy that while Republicans express somewhat more concern about immigration overall, a plurality favors a temporary worker program for immigrants, a position President Bush has championed. Concerns about immigration, and views of what to do about it, divide the public in many different ways. Significant disagreement exists between college graduates and those who did not attend or complete college, between people who are struggling financially and those who are doing well, between liberals and conservatives, and along ethnic lines. While African Americans differ little from whites in their views about most of these issues, Latinos hold consistently more favorable views of immigrants and the impact of immigration on American society. As a result, even when Republicans and Democrats do not differ overall, there are often deep divides within the political parties along ideological and socioeconomic lines. 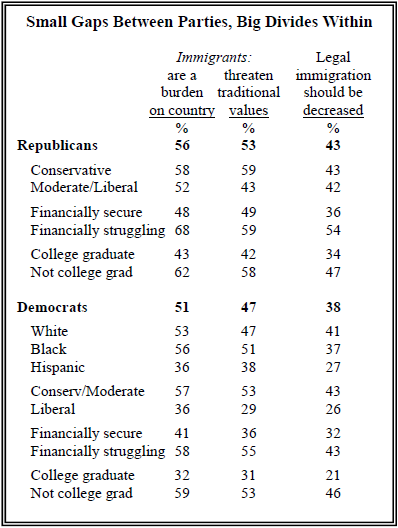 Generally financially struggling and less educated people hold more negative views of immigrants and favor more strict policies than do the financially secure and college graduates, and this is the case within both party coalitions. For example, Republicans who rate their financial situation as “only fair” or “poor” are 20 points more likely than those who say they are in “excellent” or “good” shape to say immigrants are a burden on the country because they take jobs, housing and health care, and the gap between secure and insecure Democrats is comparably large. Within each party, education also plays a major factor – Democrats without a college degree are more than twice as likely to want to see legal immigration decreased compared with those who have a four-year degree. In addition, the survey looked at five metropolitan areas that have experienced a significant increase in the foreign-born population. While respondents in Phoenix, Chicago, Las Vegas, Raleigh-Durham and Washington DC had similar views on some aspects of immigration and immigrants, there were also significant differences. Phoenix is the only metropolitan area where immigration is cited as the most important local problem. In Las Vegas, a majority says that immigrants from Latin America keep to themselves and do not try to fit in, the highest among the metro areas and significantly higher than the national result. Chicago, a historically diverse city, has seen recent population gains primarily from Hispanics. Residents of the area are generally more tolerant of immigrants and less inclined to support punitive measures for illegal immigrants. In Raleigh-Durham, a sizable majority believes that recent immigrants do not pay their share of taxes. Washington DC has a generally more welcoming view of immigrants compared with the other metropolitan areas. White and black respondents are non-Hispanic whites and blacks. Hispanic respondents can be of any race. The survey was conducted in both English and Spanish, at the preference of the respondent. Family Background refers to the respondent’s own nativity status. “Recent immigrants” include respondents who immigrated or whose parents immigrated. “Not recent” are respondents for whom both parents were born in the U.S.
A full description of the survey’s methodology appears at the end of the report. The report that follows provides detailed analysis and discussion of findings from the national poll and the five metropolitan areas surveys. It begins with a description of how immigration ranks as a problem nationally and in the respondents’ communities. This section also addresses the distinctions the public makes between legal and illegal immigration. Next is a review of concerns about immigration and immigrants, including concerns about immigration’s impact on America’s culture and economy. The third section of the report turns to the broad range of policy proposals being considered to deal with the issue of immigration. In addition to reviewing the shape of public opinion on each one, divisions in the public and within the parties are explored in detail. Public perceptions about immigrants are examined in the report’s fourth section. In particular, trends in views of immigrants from Asian and Latin American nations are tracked, along with views about the willingness of recent immigrants to assimilate. Public perceptions about the size of the legal and illegal immigrant populations are described. In the final section of the report, survey results from each of the five metropolitan areas are summarized, with notable differences highlighted among the cities and between each region and the nation as a whole. The survey’s questionnaire and results for the nation and the five metropolitan areas are at the back of the report.